Welcome to Jo’s indoor jungle! 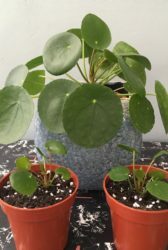 During the growing season, my Pilea peperomioides chucks out a plethora of baby Pilea, which is why the plant is often referred to as the ‘Pass it on Plant’. Propagating these plants is fun and many of my friends and family now also coinhabit with their own Pilea as a result (including one little chap in the Caro Garden Design Studio!) 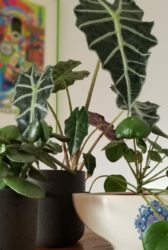 Combined with a Crassula and an Alocasia sanderiana, the contrasting shapes and forms create a pleasing tableau on the dining room table. There is room for plants everywhere, particularly the bathroom! The window ledge often doubles up as a Pilea nursery, but some other characters can also be found here. 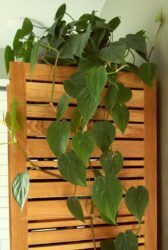 Why waste space on top of the bathroom cabinet, when you could put a plant there (in this case a Philodendron scandens, which trails and climbs)? The principles of garden design can be applied to the indoor jungle. In addition to aiming for pleasing plant combinations, it’s important to follow the ‘right plant, right place’ dictum. In a sunny spot, I’ve put a Yucca elephantipes which, with its imposing stature and large sword-shaped leaves, plays out a wonderful shadow display on the wall behind. We like to help clients choose indoor plants and planters that blend seamlessly with the architecture and interior styling of the property and also the exterior. Many of our clients are aiming to achieve an ‘indoor-outdoor’ space with their gardens, so why stop at the threshold of the door? We design our gardens for year-round interest, but, as the nights draw in and the temperature drops, it’s advantageous to bring the green indoors too.